The garage is quite a busy area of a home because it is used for many different things. Aside from being a car barn, it is also used as a workshop, storage area, and sometimes a man cave and a recreational area. Imagine what all those can do to concrete garage floors. Fortunately, there are decorative concrete coatings available made especially for heavy use. There is no need to change the entire thing. A thin layer of epoxy or polyurea polyaspartic is enough to make it resistant to weight, impact, abrasion, and a lot more. Garage floor resurfacing is one of the top trends among residential and commercial remodeling projects nowadays. Aside from getting the opportunity to restore the current slab and save money from having to remove and replace it, it also gives property owners to experience a garage floor that does not get damaged easily, requires minimal maintenance, and costs a lot less than other flooring material. Epoxy Flooring – An epoxy flooring garage coating is a popular coating because it is affordable and durable. It is resistant to most damages and its low porosity keeps any liquid or moisture beaded on its surface. This can be customized with colored micro paint chips. Just make sure that you only use this material indoors as epoxy has the tendency to discolor when it comes in contact with UV rays. Polyurea Polyaspartic Coating – This polyurea garage floor coating was made for industrial settings, such as warehouses, airport hangars, factories, and the like. As epoxy alternative, this is resistant to most types of damage. This is a bit more expensive though and for a good reason: 1-day installation. This installs, cures, and dries in as little as a day. This is why most business owners prefer this to keep operations open and running. Also, this coating is resistant to UV rays, making it ideal for both indoor and outdoor use. 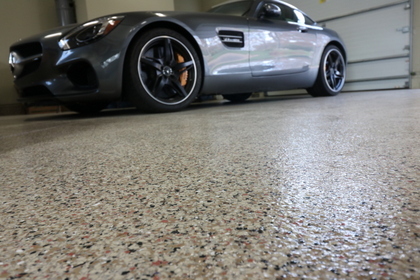 Get a superior garage floor makeover at an affordable cost. Call (773)377-8976 now! If these garage flooring ideas are something you are interested in, you can count on Chicago Concrete Resurfacing to help you acquire it. We are a decorative concrete company that specializes in resurfacing and refinishing concrete surfaces including garage floors, patios, pool decks, and more. Our team of installers is highly trained to apply epoxy and polyurea polyaspartic coatings with such efficiency. We take pride in the work we do and our skill and expertise are reflected in every single garage floor we handle. Every single installer makes sure that the coatings are installed impeccably and with great attention to detail. Give us a call or send us an email. We will schedule you for a free in-home consultation where we can assess your current garage floor, determine the most appropriate coating for it, answer all your questions, and provide you with a free price quote, too. We look forward to hearing from you!